The image above is a reference to this article about the art historical context of BIM. That image is on my mind because it’s central to the talk I’m giving next month at the CRAN Symposium in Minneapolis. It’s probably more accurate to say the first 24,950 years. But I’m rounding anyways and it makes the statement I want. Except the red circle is meaningless to you, unless you’ve skipped ahead. What am I talking about? The first 25,000 years? I’m talking about BIM. And more specifically: data. I’ve talked about different types of data before, especially the distinction between global and local data. 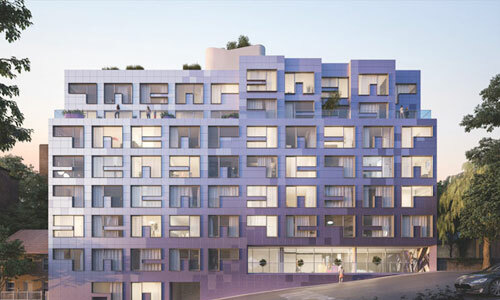 But there’s another major way to view data that we need to talk about because it gives more clues as to how we can better harness the power of ARCHICAD. I agonized over this graphic, trying to find just the right proportions. But that’s just me being obsessive. The point should be clear. We are at the inflection point between files dominated by View based data and ones where Element and Project based data trumps. Some of us are farther than others—perhaps your projects look more like Soon rather than Now, or maybe they look like Then. That’s okay. As always it is the direction of movement that matters more than where you are—or how fast you are going. We are shifting from view based data (stuff you manually add to a plan, elevation, section, schedule) to element and project based data, where information lives both in the ether of the project (Attributes, global rules, etc.) and in the individual elements. 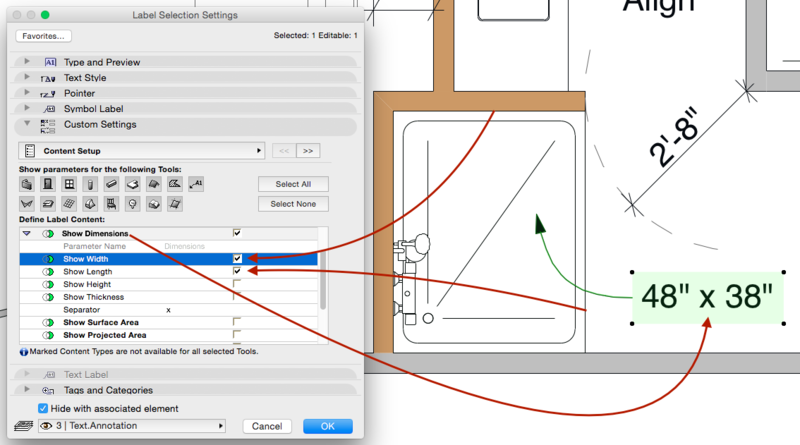 With everything you do in ARCHICAD, from how you model to how you annotate to even how you set up your shortcuts, think about where your data lives and how you can move it from View to Element to Project. There was an astute comment in my previous post—the one that inspired the diagram that led to this article. The commenter asked whether all this automation could be handled in a large firm. You can read his comment and my response if you’d like. But in short, here’s my answer: absolutely. The key is to engender a paradigm shift within your firm. When someone goes to annotate a drawing, the question shouldn’t be “what is this” or “what do I need to say?” but “what piece of information in the Element describes what I’m trying to say”. One way to look at that situation is then “which Favorite do I need to use in this instance?” Frustratingly, firm-wide best practices don’t change overnight. Projects need to be finished, coworkers need to be trained, stubbornness needs to be conquered. 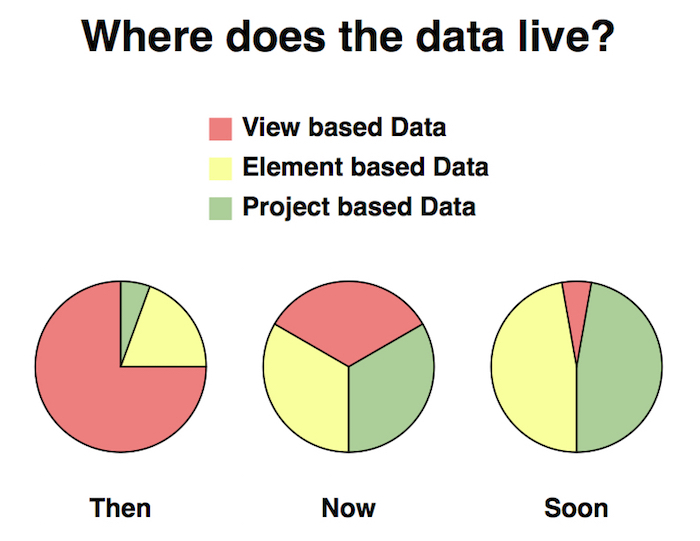 Someday we will all be in my “Soon” diagram—and not only will the data live in the elements or the project, that data will be heavily automated, available when the project is exported to others via IFC, and also meaningful. But we are not there yet. Plus for many of us residential architects, our collaborators are no where near ready, even if we are. So what can we do to engender the move from Now to Soon, or even Then to Now? 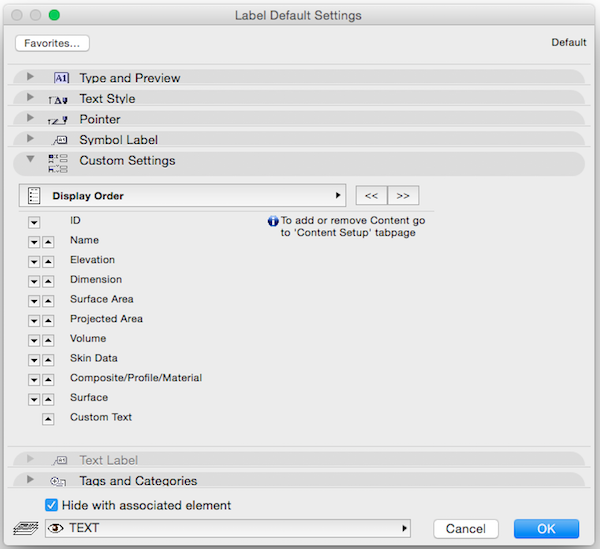 Create a Label that will show the Composite/Profile/Material of the element the Label is associated to. 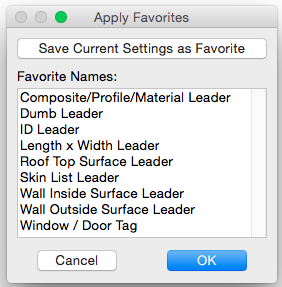 Then focus on renaming your Composites, Complex Profiles, and Building Materials to be called what you’d want them referred to on your drawings. It can be simple. Call the Complex Profile for your fascias Fascia. 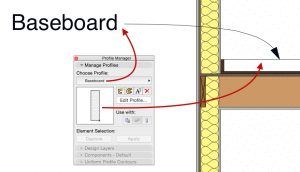 Or your baseboard Complex Profile Baseboard so that you can use that information on a drawing. It can also start off as gibberish and be refined later, since it’s all linked and easy to change. 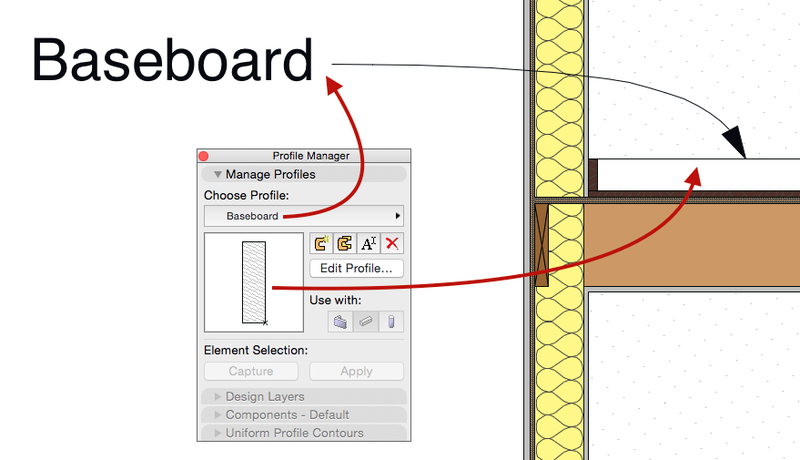 Maybe during Schematic Design, your Complex Profile is called Baseboard, Default. But by the end of Construction Documents, the Complex Profile is called 5/4 x 5 1/2″ Baseboard with 3/4″ quarter round, painted matte white. Yes all those dimensions in the name are manual, but you’re only managing that information in one location. Use the element ID as the location to store the common note for the element you need to describe. This is not the best location for this information. And it’s not hard to create (or designate) a universal IFC parameter to house this information. And much of what you will type might be automateable via another solution. And there are higher purposes for element ID. But you know what? If you are at Step 1, you probably aren’t ready for that. What you need is to start training yourself and your coworkers to use text based parameters and intelligent linked Labels. And element ID is crazy easy to use. Plus as of ARCHICAD 19, the character limit of the element ID is so high that you will never find it. The ID could be a paragraph of information. Long term, you’d want to put that paragraph of data in some other parameter. But if you aren’t using element ID for anything, try this technique for a project or two. You can always evolve to a better practice later. Oh and as a bonus tip for this process, and for when you have better uses for element ID: set up a keyboard shortcut that will activate the ID value in the Info Box. I set my keyboard shortcut to CTRL+1. Easy access to element ID is that important; it should have a shortcut and it should be easy and prominent. I’ve also moved element ID to the third line of my Info Box so that it is always visible. This is another reason why I think it’s great to start with element ID as generic common note for an element: when you click on the element, the note appears at the top of (my) Info Box. The obvious exception to this suggestion is if you are using element IDs for something else already. If you are, make sure you have a label showing that data as well. For instance if your element IDs are used to label windows and doors, or similarly label other Objects, make sure you have labels to share that info on your various drawings. Don’t forget: this is a mix and match solution. If you are using IDs properly for windows and doors, you can still misuse them for lots of other element types. Maybe you are ready for more. Maybe you read about step 1 and thought “um, really? I’m Mr. BIM (or Mrs. BIM). 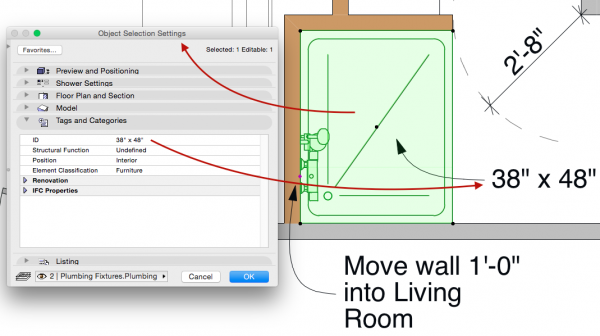 Give me some real BIM uses of the Label tool”. Well I’m going to ignore your derogatory BIM comment and tell you to proceed to Step 2. 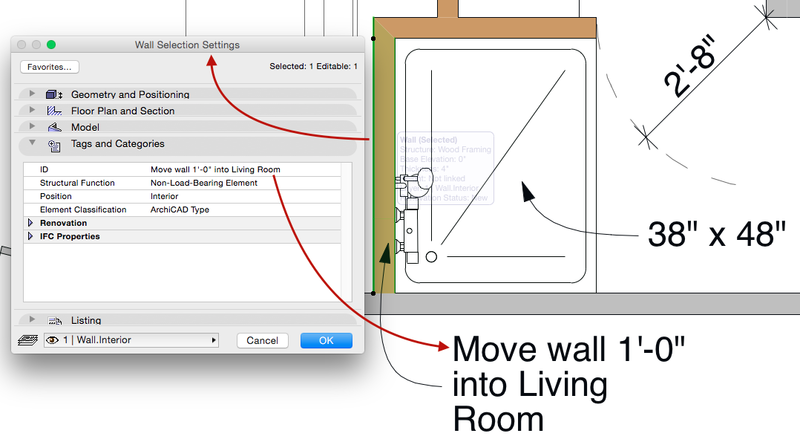 Figure out how to automatically get more data showing on the drawings. In addition to going to element and project data, we also want to go from manual to automatic data. Find ways to pull information directly from the elements so that the notes/labels update when that data changes. Then don’t freak out if that data is displayed slightly different from what you’d prefer. The world will still turn if a 36″ x 48″ tub is listed as a 48″ x 36″ tub, probably. Or if the arrow doesn’t spring fully formed from the center of the first line of text. If you aren’t ready to deal with the Label I’m showing in the previous image, this next image is acceptable too. If that’s what you need to do to get comfortable with using embedded text and smarter labels. At least that data lives inside the element, and that’s better than it being dumb, disconnected text. Linking first, automation second. For 25,000 years all our data lived in the view. We are now in transition to something better. 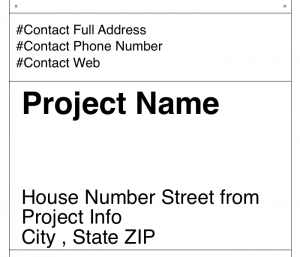 In Step 1, I wanted to get you comfortable with linking data, with getting the Label to read the Element. In Step 2, I asked you to really start thinking about automation. Automation is the future. Automation will truly make ARCHICAD faster than ever. If your Element has a size and you need to share that size, you should be able to link the Label to that size. And the same goes for any piece of data in your Elements that are derived from something else (Attributes, physical geometry, relationships to other Elements, IFC Mapping…). First focus on linking your notes to your elements, then figure out how to automate those notes. Follow Graphisoft North America on Twitter to keep track of all the latest ArchiCAD advice and news. What do you need to label? Share some examples in the comments or on the ARCHICAD-talk forum. Provide an image of what you are doing manually or just the text of what you want to automate. We’ll try to crowd source the best solution. All we have to do is be creative and clever.